Meanwhile, parliamentary opposition parties (the Liberal Democratic Party, Liberal Party, and Communist Party) display signs of weakness. After numerous instances of MPs deserting their factions as well as severe corruption scandals, their public images, rankings in polls, and legislative presence have suffered significantly. Of course, the main beneficiary of these weaknesses is the Democratic Party, which currently enjoys parliamentary control. Nevertheless, the Democrats are accused of resorting to bribery and intimidation in order to beef up their parliamentary faction from 19 seats to 39 since the 2014 elections. Despite enjoying significant popularity, Moldova’s extra-parliamentary opposition parties—which mainly focus on dismantling the current Democratic Party-centered system subordinated to oligarch Vladimir Plahotniuc—have a smaller set of tools for action. While they can mobilize public protests against abuses attributed to the ruling party and pressure the government by networking with EU decision makers, the opposition parties have scarce national media coverage, low levels of regional penetration, and considerably fewer financial resources. By contrast, both the Democrats and Socialists are well leveraged in the mediathey collectively own six TV channels—and control the local and central administrative leverages that deal with financial allocations from the public budget. Together, they have received about half of Moldova’s total state subventions since 2016. Official data shows that in 2016, they cumulatively received half the total amount granted, and in 2017, they received approximately 8 million lei out of 20 million in total funding. By advancing pro-Russian rhetoric, the Socialists actively exploit an existing division in society to advance their political goals. This geopolitical division is only further exacerbated by the Democrats’ complete inability to inject optimism into the European agenda and prove dedication to EU acquis-inspired reforms. Overall, a predatory approach toward governance prevails within Moldova, as the inner political motivations of the ruling parties regularly substitute national and public interest. The most eye-catching example of this self-interest was the recent introduction of a mixed electoral system. Ignoring the protests of civil society and the opposition and the warnings from the EU and other development partners, the Democrats and Socialists collectively voted to scrap Moldova’s proportional representation system. This outcome confirmed the long suspected bilateral cooperation between the two parties and underlined their pursuit of a “win-win” political game that ignores the incompatibilities of their platforms. However, such instances of cooperation should not preclude the possibility of a real confrontation between the Socialists and Democrats. Their radically opposed geopolitical views, for instance, serve as one area of tension that could be hard to reconcile. Yet, for now, this peaceful co-existence has mutual benefits for the Democrats and the Socialists. It facilitates the former’s goal of restoring political weight and enables the latter to expand its electoral base. This momentary, tacit partnership, however, distorts effective political competition and nurtures harmful initiatives such as the adoption of a mixed electoral system. While these two parties typically use distinct themes to construct their political narratives, they can sometimes have almost identical positions. This seemingly Machiavellian, the-end-justifies-the-means approach has been widely applied across an array of political issues: from geopolitics to religion and security issues to identity cleavages. The ruling elite seem to pay no heed to the imminent ruptures this strategy produces in an already misbalanced relationship between the political class and the citizens. As long as it continues to achieve narrowly defined political goals, such predatory governance will prevail. Playing on the East-West geopolitical divisions within society represents the favorite and most effective way to manipulate atomized public opinion in Moldova. If we follow this reasoning, the Democrats favored pro-Russian presidential candidate Igor Dodon over EU-oriented Maia Sandu in order to strengthen their position among the electorate. As a result of Dodon’s victory, the Democratic Party acquired a constant, “valuable” geo-political opponent: the pro-Russian and Eurosceptic president’s office. That is, Dodon’s unfavorable attitude toward the EU has bolstered the Democrats’ claims that the European vector of Moldovan policy depends solely on them. Recently, Dodon has started to launch anti-U.S. or generalized anti-Western statements, but he has criticized the EU less in his attempts to balance his pro-Russian agenda. Similarly, in order to divert attention away from delayed or distorted EU Association Agreement reforms, the Democrats amplify anti-Russian rhetoric. The prohibition of propagandistic Russian television and the denied entrance for persons linked to Russian hybrid warfare or the promotion of Transnistrian separatism are only few of the actions undertaken by Democrats between 2016 and 2017. The expulsion of five Russian diplomats in May 2017 followed by parliament’s declaration that Russian forces in Transnistria are unconstitutional, illegal, and must be withdrawn, further underscore the party’s perceived need to overtly posture against Russia. The Democrats followed with an initiative to include a resolution on Russian military presence, not the peacekeeping mission as such, in Transnistrian region on the UN Assembly agenda. Moscow and separatist authorities claim that withdrawing the Russian peacekeepers may lead to new military confrontations. And most recently, Moldova’s designation of Russian Deputy Prime Minister and Special Representative to Transnistria Dmitri Rogozin as a persona non grata served as the culmination of the Democrats’ anti-Russian campaign. A principled, objective, and critical attitude towards Russia’s position in Moldova is necessary, but it also requires a dose of realism and a strong awareness of the country’s national interests. Disproportionate, politicized, and poorly argued actions discredit the country and imperil its economic interests. Each action directed against Russia allows President Igor Dodon to feature both his strong pro-Russian inclination and his incoherent anti-Western criticisms. On the one hand, he accuses the Democrats of destructive measures that impede the restoration of Moldova-Russia economic and political relations. The president tends to view Russia’s decision to remove some of its self-imposed trade restrictions against Moldovan goods as an outcome of his presidency. On the other hand, the president notably externalizes responsibility for the Democrats’ anti-Russian disposition, either blaming Romania or the United States for instigating such sentiments against Russia and provoking destabilization. Furthermore, the pro-Russian president tied the United States’ assistance in the modernization of the Bulboaca National Peace Operations Center (31 km distance from the capital) to American attempts to involve Moldova in foreign military operations. In reality, the U.S. invested 1.1 million USD within the framework of the Global Peace Operations Initiative—which Moldova joined in 2012—in order to improve the training spaces for Moldovan soldiers. No excuses followed after the president visited the military areas that benefited from U.S. assistance, and Dodon personally dismissed the Russia-inspired speculations that the U.S. would build military bases in Moldova. Besides, Dodon’s main demands in the security field include international recognition of Moldova’s neutrality, which is enshrined in the constitution, and restricting cooperation with NATO. While ignoring the Russian forces stationed in Transnistria—recently defined by the Constitutional Court as “occupation troops”—the president foments apocalyptic scenarios in which Western powers hope to strengthen their influence in the region by unfreezing the Transnistrian conflict. 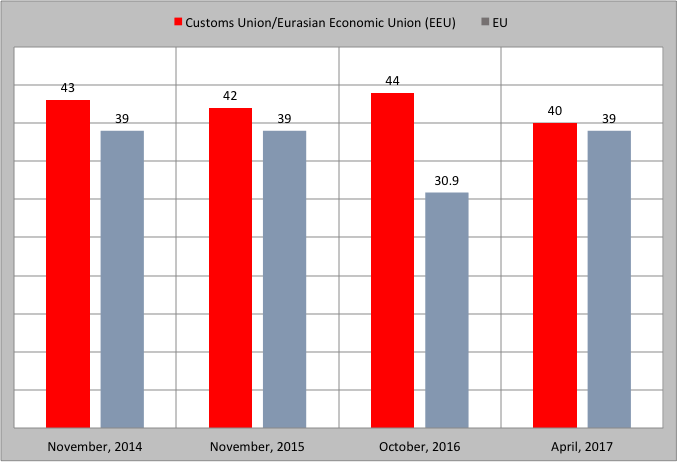 The geopolitical delineation within society has been confirmed by various polls, which mainly demonstrate that over the past few years, sympathies toward the European Union are unable to surpass those toward the Eurasian Economic Union (EEU). (See Figure 1 below) Although they share a large part of the responsibility for decreased pro-EU sentiments, the Democrats joined together with the governments of Georgia and Ukraine to request a membership perspective from the European Parliament. Disregarding their direct role in strengthening the oligarchic regime and beefing up Moldova’s “state capture,” the Democrats accuse the extra-parliamentary opposition of complicating the dialogue with EU while posing as a solid pro-EU force. Aside from just touting a pro-Russian agenda, Igor Dodon has succeeded in involving Moldova in an uncertain cooperation with the Eurasian Economic Union. In this regard, the presidential office submitted a request for observer status in the organization in March 2017, sidestepping Moldova’s legislative powers. One month later, without any support from the government, the president signed a memorandum of cooperation with the EEU. These steps have no normative legislative power to hamper the European integration process, but they do help pro-Russian forces immunize public opinion to the idea that currently improbable Eurasian integration is not impossible per se in the future. Moreover, aside from promoting the Eurasian Economic Union, the president makes constant jabs at the Association Agreement (AA) with the EU and threatens to revise or abandon it, despite the fact that it secures trade with Moldova’s largest trading partner. (Exports to the EU accounted for 65% of Moldova’s total foreign trade in 2016.) Moreover, thanks to the AA, Moldova has access to consistent and irreplaceable European assistance. In 2016, the EU carried out 145 projects in Moldova costing a total of €645 million. Dodon’s anti-EU criticisms are multifaceted and fairly sophisticated. Not only are the economic aspects of the AA under attack, but the political elements are as well. These elements mainly refer to the enactment of European values such as anti-discrimination policies and human rights. In stark contrast to the EU’s liberal values stand the traditional values of the Moldovan Orthodox Church. To this end, the pro-Russian president fortifies official and informal connections with religious clerks, including those who have organized anti-LGBT protests. Dodon recently decorated 16 priests with state awards. The Russian Orthodox Church and the Eurasianism movement have also received active support from Dodon, so as to fight against the diffusion of European values, particularly with regard to sexual minorities. Dodon displays targeted affection for families with multiple children. Through the first lady’s charities supporting multi-children families, and in conjunction with the Russia-backed World Congress of Families, Dodon has arranged a pro-family event to take place a few months before the 2018 elections. Under this conservative umbrella, Igor Dodon and the Socialists plan to exploit the existing discriminatory attitude towards the LGBT community among the public and to fortify their traditional values-oriented domestic political doctrine. The variations between pro-West or pro-Russia inclinations of the major political parties illustrates their strategy of geopoliticizing domestic politics. This artificial oscillation provoked by the existing major political parties creates obstacles for political newcomers. More than that, it disorients the population and increases skepticism towards European integration that is currently damaged both by the oligarchic-ruling party leaning towards West and by the pro-Russian Socialists and the Moldovan president leaning east. While Moldova’s Democrats and Socialists are incompatible geopolitically, they agree on many issues such as support for the mixed voting system and the desire to restrict the activity of Western-supported civil society. Nevertheless, a harsher conflict between the two parties is entirely possible. It may occur if Igor Dodon pledges more loyalty to Russia by making promises like pushing Moldova into the Eurasian Economic Union, or if Vladimir Plahotniuc decides that the Democrats’ tactical alliance with the Socialists has lost its utility. The Democrats have proved in the past that when it comes to politics, they favor loyalty over friendship or partnership. The Democrats’ role in the decomposition of the Liberal Democratic Party and the elimination of former Prime Minister Vlad Filat—who is now serving a 9-year sentence for corruption—serves as a clear example of this political approach. The same scenario has been repeated with the Democrats’ other political opponents, and it’s possible that the Socialists could turn into their next political victims. Impeachment proceedings against Dodon before the 2018 elections are not unreasonable, and some have already begun calling for his impeachment. However, should an impeachment occur, it will likely consolidate the Socialists’ electoral base and trigger massive protests that could draw significant participation from other camps of the opposition. Such a scenario could be insurmountable for the Democrats. Yet, as in the past, in the face of challenges, the Democrats will always have their strategy of using Moldova’s geopolitical divide to regain political traction and validity. *Denis Cenusa is a political scientist from Moldova, who works as Program Director on Energy Security at the Independent Economic Think-tank “Expert-Group”, based in Chisinau.